Book making projects for kids do not have to be complicated. It's fairly simple for children to create short picture books with only minimal help from adults. In fact, there are several types of books kids can make. This book represents the musical instrument in that it doesn't require cutting, just a series of folds. Kids can see all of the book's pages simultaneously if they stretch the book out flat. It makes for very easy storytelling. To make this book, you need a long sheet of paper. Think a length of at least 16 inches. Anything shorter than that and you will have a very short story. You also need one sheet of cardboard or card stock. It need not be larger than eight inches by eight inches. Lay the paper down lengthwise and fold it so that the left edge and right edge come together. Crease. You now have a two-page book. Fold the first page so that the right edge meets the "binding" of the book. Turn the book over and do the same thing for the opposite side. Cut the cardboard so that you have two pieces that are each the size of one page of the book. Glue the cardboard "covers" to the first and last page. If you've ever read The Very Hungry Caterpillar, you've seen a ladder style book. The pages get progressively longer as you move through the story. It's pretty easy to make one, and kids can align it either horizontally or vertically. You need three sheets of standard printer paper (8.5" by 11"), two foot-long sections of yarn, a ruler, a pencil, a paperclip and a single hole punch. Put one piece of paper in front of you widthwise. Use a rule to mark 1.5 inches from the top edge and draw a faint line. Place the top edge of the second sheet of paper on this line. Repeat this process to place the third sheet 1.5 inches lower. Now you have three "rungs." Keeping the papers in this position, fold the bottom upward, essentially dividing the lowest rung in half. You'll notice that you now have six equal rungs. If you find yourself with less the six, make sure you folded all three sheets of paper when bringing the bottom up. You may have to adjust a bit to make the rungs even. Use a paper clip to secure the last fold you made. Punch two holes in the paper at the fold, one a half inch in from the left side and one a half inch in from the right side. Make sure the holes go through all three sheets of paper. Feed a piece of yarn through the hole on each side. Tie the yarn in knot and then a bow. This will keep the book together and allow you to turn the pages. If you're working with very young children, you may want to stick with an even easier book to make. All you need is standard printer paper and a stapler. Fold a piece of printer paper in half, and then in half again. Note that you will have a booklet shape. Fold additional sheets of paper in the same manner and insert them inside the first booklet to make interior pages. Unfold the book along the spine when you're finished and staple the pages together here. That is all there is to it. If your book gets so thick that it isn't able to close, you may have to cut the spine. Then, simply line the pages up along their left edges and staple the book together that way. 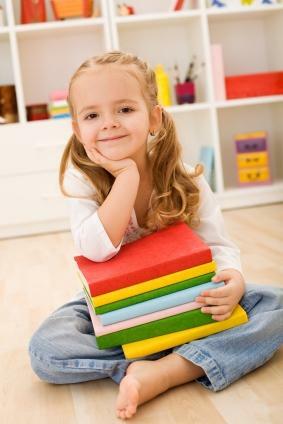 Encourage kids to use their imaginations in their book making projects. For kids, the best part is probably not the assembly, but using markers, glitter, crayons, etc. to decorate the book and make it their own.